What is the "acceptable" level of radon in air? The EPA states that any radon exposure carries some risk(link is external); no level of radon exposure is always safe. However, the EPA recommends homes be fixed if an occupant's long-term exposure will average 4 picocuries per liter (pCi/L) or higher. What is a "picocurie" (pCi)? A pCi is a measure of the rate of radioactive decay of radon. One pCi is one trillionth of a Curie, 0.037 disintegrations per second, or 2.22 disintegrations per minute. Therefore, at 4 pCi/L (picocuries per liter, the EPA's recommended action level), there will be approximately 12,672 radioactive disintegrations in one liter of air during a 24-hour period. 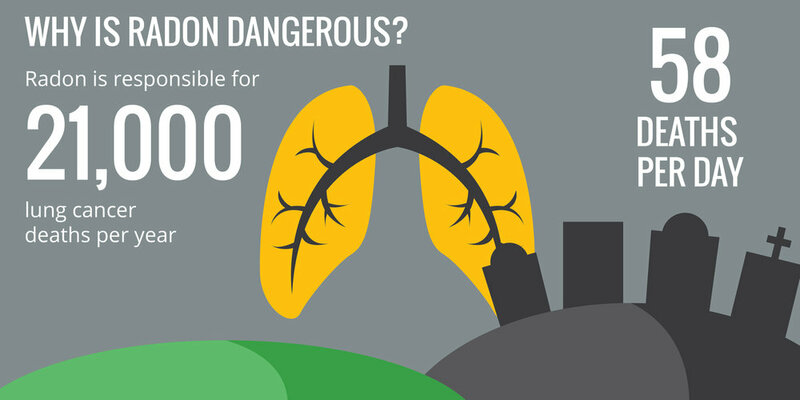 Radon is widely believed to be the second leading cause of lung cancer. Therefore, the EPA and the Surgeon General recommend testing for radon in all homes below the third floor. Contact us today to have your home tested for Radon!